The mere thought of interacting with FDA causes a great deal of stress for some medical device manufacturers. Right or wrong, the agency has developed a reputation for being less than accommodating and communicative over the years (though there are signs that its chilly demeanor is starting to warm). Plus, it’s easy to cast the relationship between industry and FDA as inherently adversarial; after all, the regulator casts a rather long shadow over the pathway to market for new medical devices and diagnostics. However, communication with FDA is inevitable, and positive, productive interaction with FDA can make or break your product development efforts — or at the very least accelerate (or impede) your time to market. 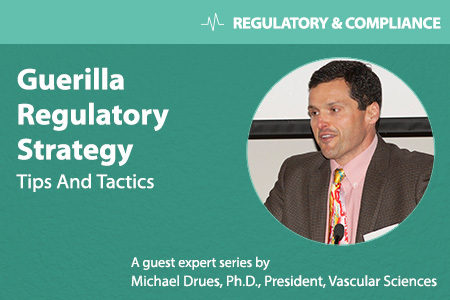 In this installment of Guerilla Regulatory Strategy, we’ll explore the ideal timing to start engaging the agency, the formal and informal mechanisms for communicating with them, and what I think are the three keys to successful interactions. One of the most important aspects of communicating with FDA is the timing of that communication. In my experience, most companies start interacting with FDA very late in the product development process, usually when they're about to make an actual submission — a 510(k) (premarket notification) or PMA (premarket approval), for example. Sometimes the first contact occurs at the point of submission (or even after), and in a small number of cases, company policy prohibits any communication with FDA whatsoever, outside of the actual formal submission itself. In my opinion, that is a huge mistake. It's a big mistake for lots of reasons, not the least of which is that it leads to a lot of questions upon review. In other words, the industry practice basically has evolved to the following: The company makes its submission, the agency sends a bunch of questions, the company responds to those questions, the agency comes back with some more questions, and so on. Sadly, 70 to 75 percent of first-time submissions are rejected by FDA, for a bunch of different reasons. This leads to a game of ping pong, back and forth, which can often go on for months and sometimes even years. At the end of this process, if you are lucky, the FDA will grant your clearance or your approval or whatever it is. In my opinion, this is very inefficient, because it takes a lot of time, it costs a lot of money, and quite frankly, most of it is totally avoidable. Unlike some others in the field, when I get questions upon submission of a 510(k) or PMA or de novo, I view that submission as a failure. I work very hard to get most, if not all, of the questions addressed in advance, prior to the submission, as opposed to afterwards. The way I look at it, if you can get those questions resolved in advance, by the time you actually make the submission it's really just a matter of collecting the appropriate signatures. This is not the common practice, but it is my goal, and it leads to a much quicker and more efficient process of getting devices onto the market. These are just two of many examples of the kind of problems that are totally foreseeable and mitigatable — and, in some cases, completely avoidable — through advanced communication with the FDA. In my opinion, it is never too early to begin a dialogue with the FDA, or other regulatory bodies for that matter. I’ve focused this discussion on the FDA, but the same logic applies to dealing with Health Canada or the EU or any of the other regulators that medical device companies have to deal with. While it's never too soon to start talking to FDA, there is one big caveat. That is, you have to lead, not follow, and tell, not ask. It never ceases to amaze me how many people walk into the FDA and ask, essentially, “What do I do?” or, “Here's what we plan to do. What do you think?” In my opinion, they are making a huge mistake because, quite frankly, you open up a Pandora's Box. You have no idea how the FDA is going to respond. Believe me, the reviewers that are in the room with you will voice their questions if they have concerns. That's their job. You don't have to give them additional opportunities to ask questions. You present your plan, and then you simply shut up. You stop talking, and whatever questions or concerns that they have, they will raise them, and then you begin a dialogue. In my view, this is a partnership between the company and the FDA, though to a certain extent it is an adversarial relationship. In other words, the company and the FDA should not be the best of friends. There should be mutual respect. People obviously should be polite, but in a lot of ways, this is a little bit like the American legal system, where there's a prosecution and a defense. That's the way that the system is designed to work best. To summarize, the best time to start talking to the FDA is as early as in the product development process as possible, but not until you've done your homework and come up with an ironclad regulatory strategy. Communicating with the agency is not something you take lightly, going in on a whim. It takes a pretty significant amount of time to be able to develop a logical regulatory plan and be prepared to defend it. There are many different ways in which a medical device company can communicate with FDA, both formally as well as informally. On the formal side, there is the Pre-Submission program, often referred to as the Pre-Pub. FDA released a guidance document on the Pre-Sub last year, and the program is growing in popularity, with more companies starting to take advantage it. That’s a good thing. In addition to the Pre-Sub, there's also the 513(g), which is basically the request for information, a formal way companies can ask FDA questions. But even in the 513(g), I still follow the “lead, don't follow, tell, don't ask” approach. I won't use the 513(g) to specifically ask a question; I will be much more definitive. In some cases, the request for designation (RFD) process is appropriate. RFD was established to help manufacturers determine whether their product will be classified as a drug, device, biologic, or combination product, and which center within the agency will handle its review and regulation. For instance, several of the products that I'm involved with right now are medical devices, but they are made out of proteins. Some might construe such devices as biologics, or perhaps even as combination products. You certainly don't want to assume that your product is going to be regulated as a medical device and make your 510(k) submission to the Center for Devices and Radiological Health (CDRH), only to have the agency tell you that you actually need to submit a Biologics License Application (BLA) to the Center for Biologics Evaluation and Research (CBER). That would be a huge disaster. So, you may want to use the RFD process to get a definitive, early read on how your product is going to be regulated, before you get too far along in development. Again, in some respects I view the relationship between the device maker and FDA as a partnership. In addition to spending most of my time working with industry, I also work part time as a consultant for the FDA, so I see a lot of these issues from both sides. Many reviewers have told me that personally they get a little frustrated when folks from medical device companies treat them as if they were the enemy. Some device makers essentially ask FDA, “What is the minimum I have to do in order to get you to sign off on whatever I'm asking you to sign off on?” If you had that kind of a job, and people were coming to you like that every single week, sooner or later, you're probably going to get a little defensive. You might even get a little cynical. Yes, we're in this business to make some money, but more importantly, we're in it to help people as well. In my experience, the collaborative approach has been a much more effective strategy. In closing, I’d like to share a few general best practices for communicating with FDA. First, as I mentioned earlier, you should make sure you have a very well thought out, very well developed regulatory plan. And, you should be able to present it in a clear and concise fashion. That's recommendation number one. One of the things I do with medical device companies is play devil's advocate. Prior to going down to the agency and making their submission and pitching their pitch, they ask me to come in, take a look at the application, sit through their presentation, and, if I can be a bit bold, bash the heck out of it. If they're going to make a mistake, it's better for them to make it in front of me than the folks down in White Oak, where it really matters. Don't treat the FDA as your beta tester. Make sure that you have practiced defending your plan. One of the philosophies that I have developed over the years is that you cannot anticipate every problem or question, but you can anticipate many. Try to anticipate. Put yourselves in the shoes of the reviewer. If you were the reviewer and this submission came to your desk, what questions would you have? What concerns would you have? My third, and final, recommendation — and perhaps most important — is be definitive. Be confident. Don't be timid. Walk into the agency and say, “This is what we're planning on doing, and this is why.” Again, it’s telling, not asking; leading, not following. I spend a lot of time working with surgeons. Surgeons are some of the most confident (one might even say arrogant) people on earth, and the question is, do you want it to be otherwise? If a surgeon is doing a procedure and something happens, do you want them to say, “Oh gee, I'm not sure what to do. Let me consult the regulation?” Indecisiveness is not a good trait for a surgeon to have. I think medical device engineers and regulatory professionals can learn a lot from our surgical colleagues. Be definitive. Reviewers will respond to that. If they have questions or concerns, they will raise them. This is when the dialogue begins, as the system is designed to work.